What exactly video format does UA46B7000 support ? I've searched but only found support chart for other models. 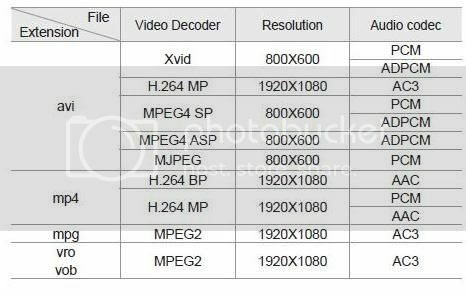 Can you please provide me File Format/Video Codec/Resolution/Audio Codec chart ? You are posting a reply to: What exactly video format does UA46B7000 support ? You are reporting the following post: What exactly video format does UA46B7000 support ? 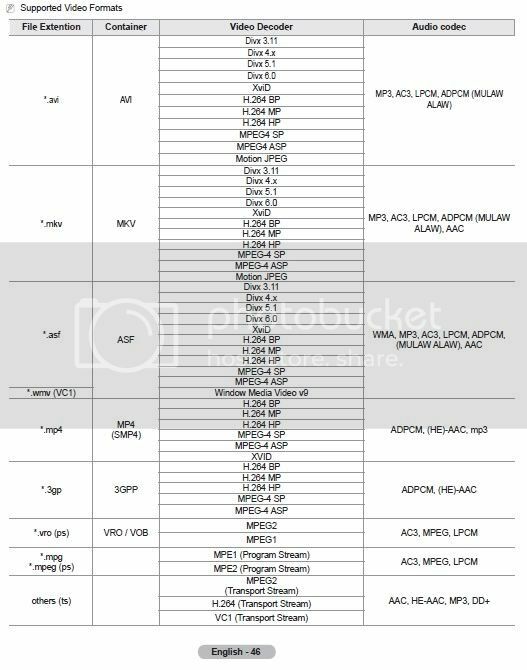 In reply to: What exactly video format does UA46B7000 support ? Another confusing reference. I found 2 charts ... which one suppose to be true for UA46B7000 ? In reply to: Another confusing reference. It varies by region, and I can only really speak to U.S. products. Both of those charts you posted, however, were snipped from the manuals, which you can download at Samsung.com. I would recommend going to the Samsung site for your region, click on Support, type in the model you're looking for, go to the downloads tab and then download the manual for that specific model. The charts MAY vary by region - again, I can't speak to that - but the charts listing compatibility are contained in the manual.